By Kathrin: My clients keep asking me what they can do to work out a problem or attract a certain outcome. The tarot has many helpful answers and I am happy to send people off with the right “tools” to get through a hard time, heal heartache, or find the strength to move on. Sometimes you may not have time to work intensely through your problems and only need a quick shift of the energies around you. I will show you what you can do, to raise the vibration in your daily life. You probably know bay leaves (also called bay laurel leaves) as a cooking herb, and they are easy to find at any grocery store. Indigenous to the Mediterranean region, bay leaves have also been known for ages for protection and abundance magic. They are sacred to the Olympian God Apollo and even the Pythia, better known as the Oracle of Delphi, has been said to have chewed bay leaves to induce visions. Even though bay leaves can make your stew tastier, you won’t need to chew them for this little ritual. Meditate on it for a little while and set your intentions. What would you like to attract into your life right now? Happiness? Love? Money? Write it onto the bay leaves and burn it to send your wish out into the Cosmos. Don’t be scared, when you light up the leaf! It will crackle a bit and burn fast, but the flame will also go out pretty quickly. Now go about your day. The Universe received your message and the solution is on its way to you. What this method will not do. Just to get this out of the way, you cannot make anyone develop feelings for you that are not there. This would fall under the aspect of black magic and Karma will bite you in your behind faster than you can run! This method can, however, open you up to receive the right kind of love that you won’t have to beg or hope for. It will just find you and be effortless. You can also protect your home, by placing a bay leaf in every corner of your place. 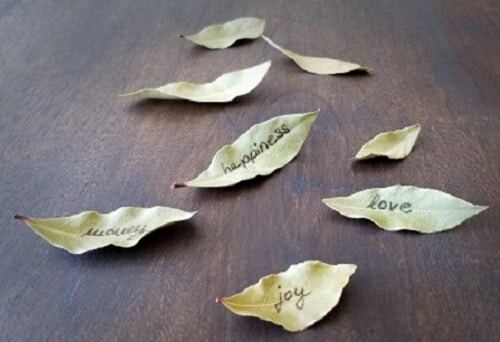 If you want to cleanse your space from negative energies, go ahead and sprinkle broken up bay leaves over your floors. Start sweeping into the room that is the furthest away from your main entrance and work your way towards the front door. This is especially helpful for those of you who cannot smudge with sage because the smoke would either aggravate your lungs or the people around you. I trust everything will turn out for your highest and greatest good. If you have any questions, please do not hesitate to contact me. I am more than happy to help, clarify and give more insight.